WHAT IS THE KISSING BANDIT? Now for the exciting part! 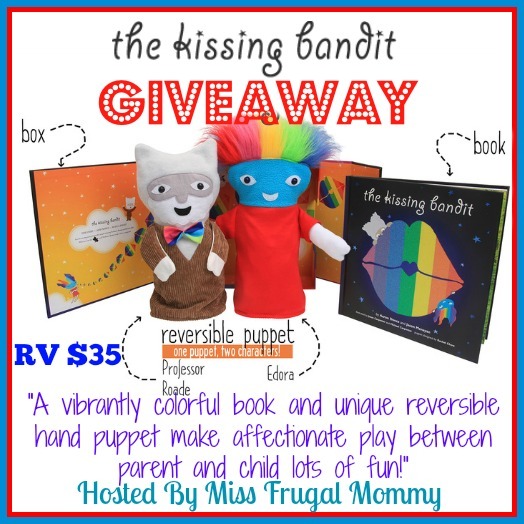 One lucky fan is going to win the Kissing Bandit book, box and puppet! This giveaway is open to US residents 18 and older. Enter to win in the giveaway tools below, all entries will be verified, one entrant per household or you will immediately be disqualified. Winner will be contacted via email and has 48 hours to respond before a new winner is chosen. Prize fulfillment is the responsibility of the sponsor and not the participating bloggers. Good Luck!!! Next post: Time to let the HERO Out!! New Super Hero Costumes! I learned that puppets can be a valuable educational tool. I think puppets are a great way to use ones’ imagination. You can work through just about any situation with your kids through acting out the scenes with puppets. The puppets keep the kids engage and they will retain what they have learned. I love puppets. I learned that Spoiled Babies Grow Up to Be Smarter, Kinder Kids. It makes sense to me because when babies are in their development stages the better they treated and the more they are loved the more they are likely love back when they get older. Thanks for the articles. Loved it. demonstrates the parent & family values of kissing and hugging your child with giggle and laughs and lots of fun. It demonstrates and teaches the value of kissing and hugging your child.